Today, October 17, is National Pasta Day! To celebrate, I’m honored to partner with premier Italian cookware maker Lagostina for my first ever giveaway. I’m giving a Lagostina Martellata Hammered Copper Pastaiola, like the one you see in this post, to one of lucky readers/followers (a $249.99 retail value!!). Lagostina gave me one of these beautiful pots to make my recipe for pasta day and review it in my post. You can get one of your very own by entering to win my Lagostina giveaway here. your vision makes my weak heart glow. the simple you is that I crave. for silky ribbons that enthrall. this feast for me is like a kiss! It’s no secret that my pasta is my favorite food. I’m a pasta fanatic and love to cook it as much as I enjoy eating it. For me, every day is pasta day. But today, October 17, is officially National Pasta Day so I can openly gush about pasta and share one of my most popular recipes with you in hope you will share in my enthusiasm. When Lagostina asked me to cook up a special pasta with their hammered copper pot for National Pasta Day, I didn’t have to think long about what to make. As a professional Italian chef, I have many delicious pasta dishes in my repertoire. But to appropriately honor the name of pasta, I dedicate this post to handmade fresh egg pasta—known as pasta fresca or pasta all’uovo in Italy—to truly capture the essence of what a delicacy pasta is. For me, it’s more about the quality of the pasta and less about the sauce. Sure, I love a good Carbonara, but when I talk about pasta…I mean fresh pasta. The kind that’s made from nothing more than flour and eggs then stretched into transparent, paper-thin sheets and cut into long ribbons. 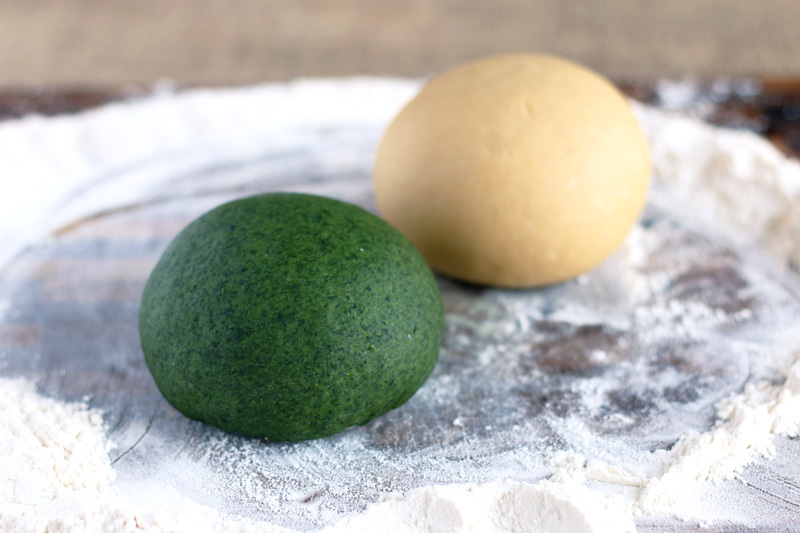 To make them even more beautiful, I add cooked spinach to the half the dough and make paglia e fieno pasta that, well, looks like its name: straw and hay. Making fresh egg pasta is easier than you think and gives so much satisfaction. 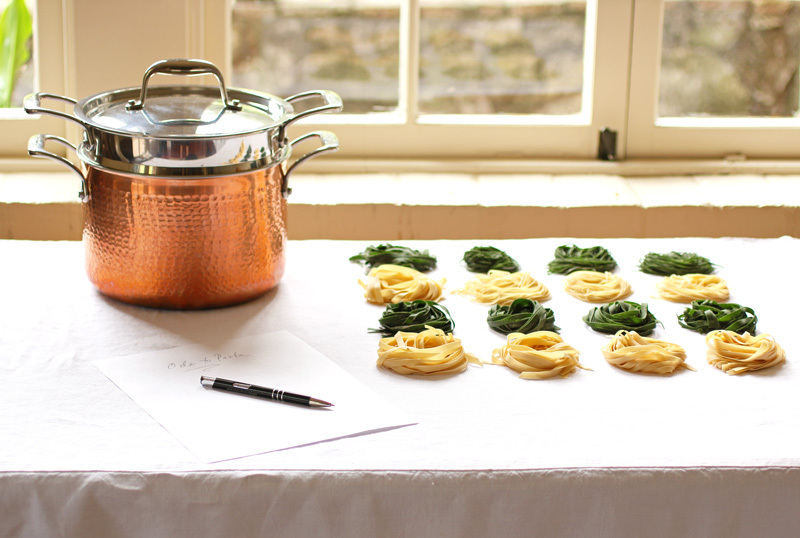 I’ve been making fresh pasta for decades and teach special workshops on it to eager students. When they see how easy it is they are amazed. But when they taste…oooh, that’s a whole other pasta experience. They close their eyes, they smile, they swoon. 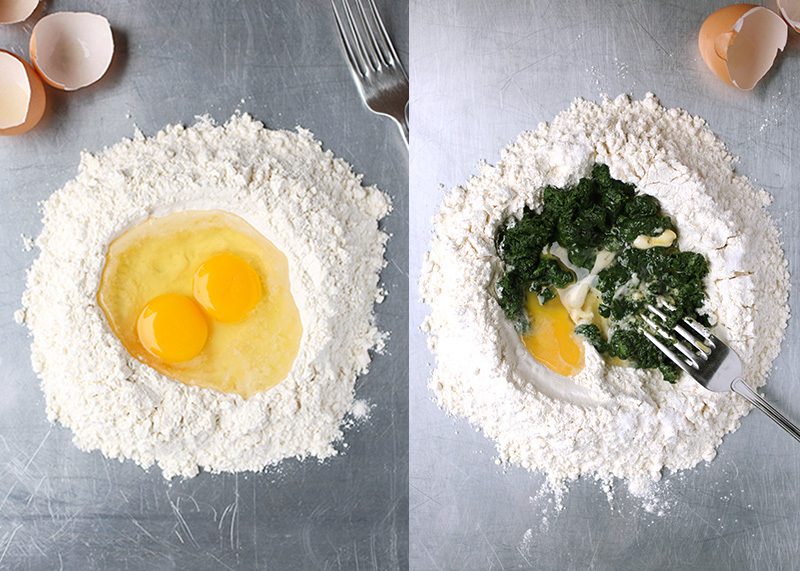 All you need to make delicious egg pasta is flour (preferably Italian 00 grade), eggs and some elbow grease. The secret is to incorporate the flour gradually into the eggs so they absorb only what they need without becoming dry and stiff. Then, after about 10 minutes of kneading (here you can recruit a friend, family member or glass of wine to help), you’ll have a soft and elastic ball of dough to roll out and cut. For this, you’ll need a pasta machine with rollers. I use both the hand crank type and a pasta roller attachment on my electric mixer to equal effect. 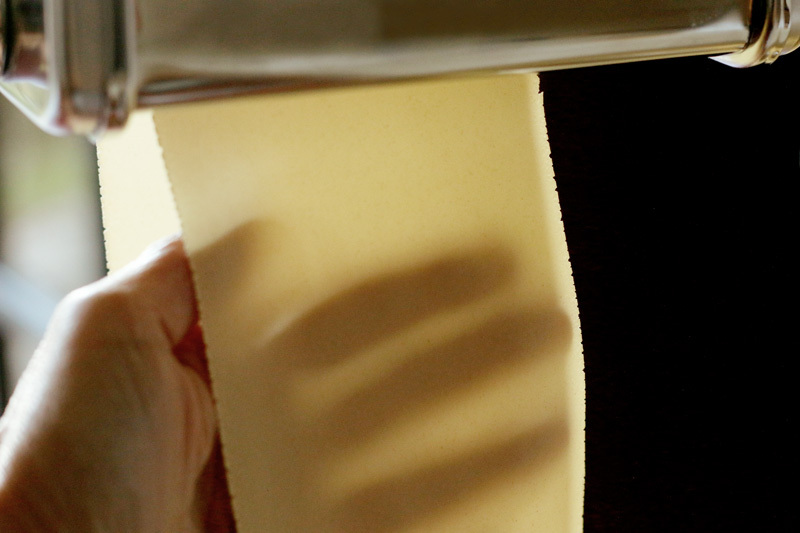 When rolling out the dough for fine pasta, the thinner the better. This is accomplished by repeatedly passing the dough through the machine rollers while reducing the width of the setting with each pass to gently stretch and thin out the dough. Here, these pasta sheets are rolled to setting number 5 on my Kitchen Aid pasta roller attachment for my electric mixer. Once rolled thin, the pasta sheets need to dry slightly before cutting or else the ribbons will stick together. Lay the sheets flat on a cloth covered table until leathery but still quite pliable then cut into long ribbons using a pasta cutting attachment or sharp knife. These pasta ribbons can be cooked immediatley or formed into nests to dry and store for later use. 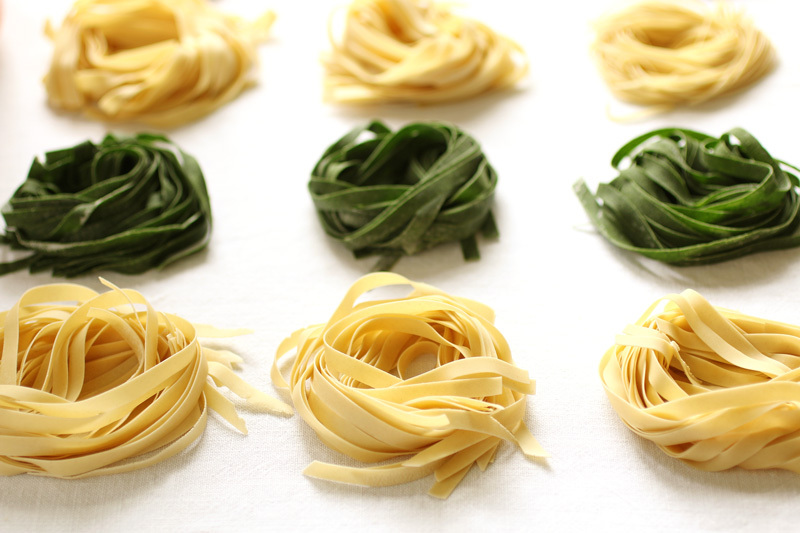 Thin, egg pasta ribbons cooks up in as little as one minute when fresh and only 2 to 3 minutes when dried. They make a colorful tangle on your fork and are tender and delicate to the bite. 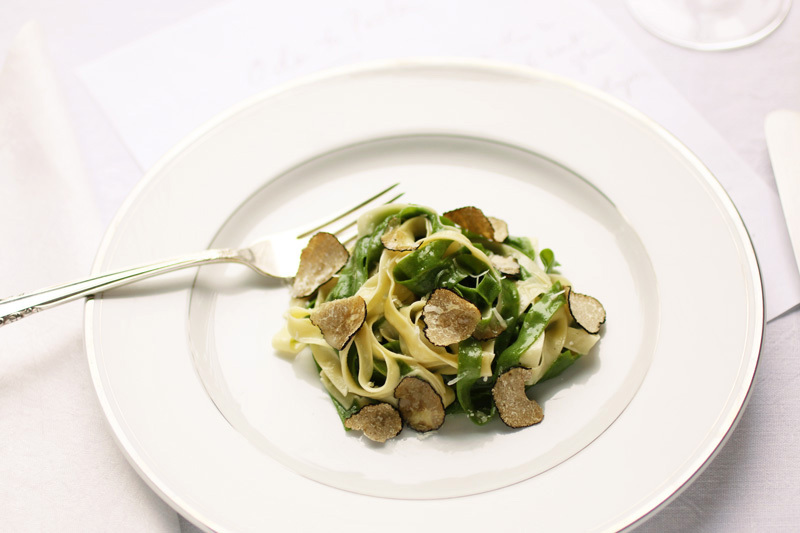 I like to pay them the ultimate compliment by serving simply dressed in a silky sauce of melted butter and pasta cooking water, melted Grana Padano or Parmigiano then scattered with sinful shavings of fragrant, earthy truffles. What more could you ask for? I am passionate about pasta and Lagostina loves it as much as I do. 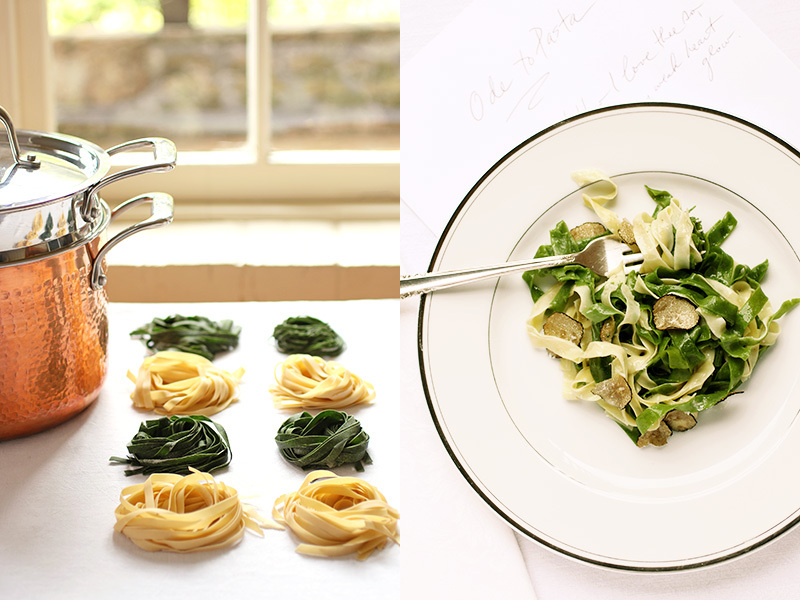 In fact, they created a special pot to perfectly cook pasta called the Martellata Hammered Copper Pastaiola. Made of high quality materials with elegant design, it not only looks beautiful in your kitchen, but its professional level features make cooking a pleasure. The hammered copper exterior gives it and eye-candy appeal while conducting heat superbly and is lined with sturdy stainless steel for ease of cleaning. 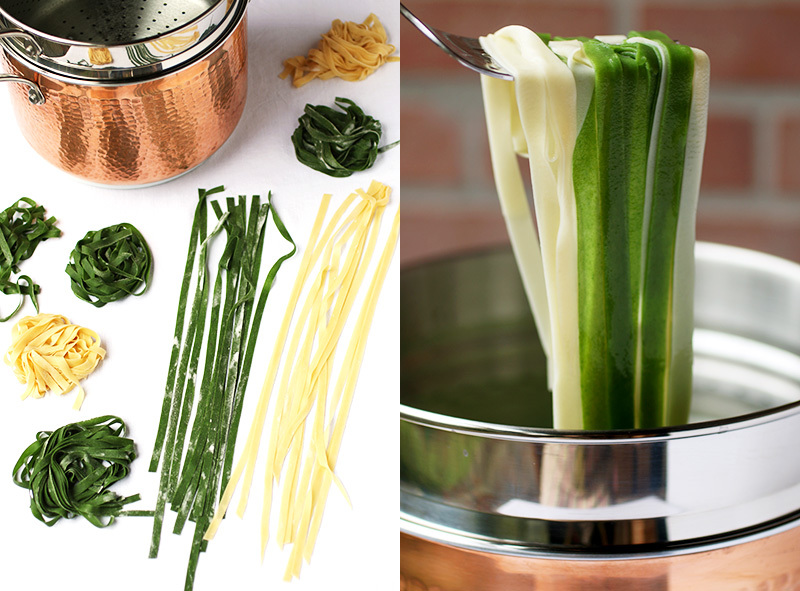 A removable strainer insert lets you cook pasta then drain it easily while reserving essential pasta cooking water for adding to the sauce is also handy to make stock or boil vegetables. In fact, I used it to cook the spinach for my green pasta dough. As a professional chef, I also love that Lagostina thought to sandwich an aluminum core in the triple thickeness of the pan for uniform heat distribution and it can go from stove top to oven to table. I can honestly say that the Lagostina Martellat Hammered Copper Pastaiola cooks as good as it looks and was a true pleasure to use. Thank you Lagostina, for making this National Pasta Day more like Christmas by offering a giveaway of your product to one of my lucky readers! Click here to enter the Lagostina Martellata Pastaiola giveaway! **In this video I show students how to roll fresh pasta ribbons into nests for drying and storing. Bring a large pot of water to boil with 1 tablespoon salt. Add the spinach, cover and cook until tender, 5 to 7 minutes. Remove spinach from water and transfer to an ice water bath for a few minutes to cool and preserve bright green color. Drain then gather spinach into a ball and squeeze to remove excess water. Place ball of spinach in the center of a clean tea towel and wring out all remaining water until dry and putty like. Chop spinach finely. Mound the flour on a clean, dry work surface and sprinkle with the salt. Form a deep, wide well with a uniform retaining wall in the center of the flour. Break the egg into the well and add the chopped spinach. 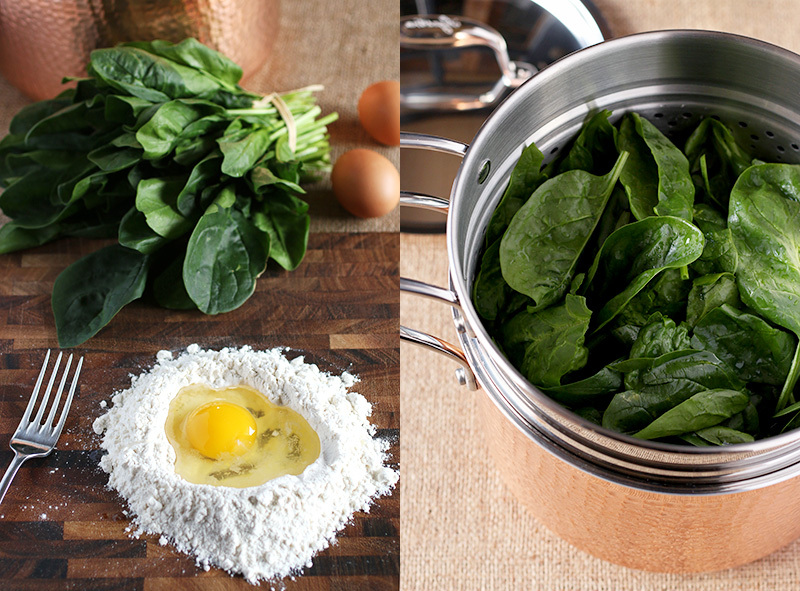 Use a fork to beat the eggs and spinach while dragging flour, a little at a time, from the inner walls of the mound into the liquid center without letting the walls collapse. The eggs will thicken as they absorb as much flour as needed to form a soft, crumbly mass. Gather the moist dough together with your hands and set aside while you prep the kneading surface. Use a dough scraper to push the remaining flour to one side then scrape any caked dough from work surface. Sift the flour through a mesh strainer to remove any lumps of dough then place it to the side of the clean surface. Wash and dry your hands to eliminate all traces of flour and dough. Dust the work surface lightly with some of the sifted flour and place the mass of dough in the center. Knead the dough with your hands while adding as much or little of the reserved flour as the dough will absorb without becoming stiff and dry. When you have a soft dough that is no longer sticky to handle, scrape the board clean and wash and dry your hands again. Knead the dough by pushing it away from you with the heel of one hand then folding in half from top down and turning 90 degrees. Repeat the motion (pushing, folding and turning) for 8 to 10 minutes until dough is smooth, elastic and compact, adding a slight amount of flour if sticky. Test the dough by pushing a finger into the center of it. When it comes out clean with the slightest whisper of moist feel, the dough ready. If your finger sticks, knead the dough again adding a little more flour. Form into a neat ball, wrap in plastic and let rest for at least 30 minutes before rolling. Repeat the same procedure for the spinach pasta omitting the spinach and adding the extra egg. Divide the dough balls into quarters and run each piece through the widest setting of a pasta rolling machine (usually number 1). Fold dough in thirds like a letter and run through the wide setting again. Repeat a few times with all the dough then run each piece through the machine once for each setting, reducing the width of the rollers consecutively until pasta sheets are the desired thickness. You should see your hand in transparency through the thin sheet of pasta. Repeat with all the dough then lay the pasta sheets on a large, clean cloth to dry until slightly leathery yet pliable. Cut sheets into pasta ribbons using the cutting roller of your machine. Cook pasta ribbons as directed below or form into nests and dry completely before storing in airtight containers for up to one month. Bring 5 to 6 quarts of water to boil in a large pot over high heat. Season the water with a generous handful of salt then return to a vigorous boil. Drop all the pasta ribbons into the water and stir to prevent sticking. Boil the pasta until cooked "al dente", tender yet firm to the bite, 1 to 2 minutes for fresh pasta and 2 to 3 minutes for dried pasta. While the pasta cooks, melt the butter in a large skillet over medium heat for 2 minutes until golden. Add 1/2 cup of pasta cooking water, all of the grated cheese and half of the truffles sliced wafer thin. Stir over low heat until smooth. Drain the cooked pasta, reserving the water, and place directly in the skillet with the butter. Toss the pasta ribbons in the sauce for 1 minute, lifting and folding to evenly coat and adding more pasta cooking water if needed to maintain a loose, juicy pasta. Arrange the pasta ribbons in neat nests on warm plates by lifting the strands with a fork and twirling onto the center of the plates. Shave the remaining truffles over the top of each portion and serve immediately. © 2016-2017 Deborah Dal Fovo, La Bella Vita - The Art of Italian Living. All rights reserved.